Holyrood House, also known as Holyrood Palace, is the Queen’s official residence in Edinburgh. She comes to stay only once a year but she does call in on other special occasions. We thought this palace was fascinating, partly because it’s much more “down to earth” than some of the bigger Royal residences. The whole place has an impressive history too and you’ll get to visit the oldest towers where Mary Queen of Scots lived along with the newer additions to the palace with some striking but beautiful rooms. If that wasn’t enough, the palace is one the site of a former Monastery and the ruins of the Abbey still remain and are open to visitors in the gardens. These ruins are a photographer’s dream and we spent quite some time in the ruins taking photos. Also on the site of Holyrood House is “The Queen’s Gallery”. This former church has been converted into a gallery space for exhibitions and to allow artefacts and some of the most delicate works of art from the Royal Collection to be shown in Scotland for the first time. A joint ticket for the Queen’s Gallery and for Holyrood House is available. We did not visit the gallery. Holyrood House is at the bottom of the Royal Mile, next to the new Scottish Parliament building. It’s open daily from 9.30am – 4.30pm in the winter and from 9.30am – 6pm in the summer. The palace is closed when the Queen is in residence and on a handful of other days throughout the year. Adult admission is £10.25 but there are concession tickets for over 60s, students and under 17s (2011 prices). A family ticket is also available. Holyrood House is one of the stops on the Hop-on, Hop-off Edinburgh Bus Tour which is a great way to get around. 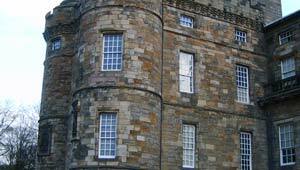 Our recommended hotel in Edinburgh is Ten Hill Place which is a short walk from Holyrood House and the Royal Mile. As always, we only recommend hotels we have actually stayed in and feel comfortable recommending to other people. This hotel was lovely!